Payroll services help businesses pay employees correctly, manage tax withholdings, and ensure accruals and deductions are taken for benefits, retirement savings, and garnishments. We looked at the most popular and affordable payroll companies that provided payment choices, tax compliance, reports and other services small businesses need to manage their payroll. For businesses that want their payroll service to offer an employee self-service portal and the option to purchase workers comp and health insurance, consider Gusto. Gusto provides a full-service human resources (HR), benefits, and payroll solution that starts with electronic onboarding and e-signature for a low monthly price. It also offers a free 30-day trial. Zenefits Firms that want to offer best-in-class employee benefits to their staff. Which Payroll Company Is Best for You? If you don’t need all these features in your payroll service, consider free or low-cost payroll software options instead. They’ll calculate earnings, deductions, and payments, but you’ll have to do your own state new hire reporting, tax filings and manage HR compliance yourself. Based on the features above, we recommend Gusto as the best payroll service for small business because it integrates seamlessly with free time and attendance software, Homebase. It provides your employees with a self-service portal to view and update their personal data and see their pay stubs online. It also includes onboarding, online document storage, and does federal and state tax filings for you. We recommend Gusto payroll for any small business — fewer than 100 employees. It’s a low-cost cloud-based payroll software service and offers benefits too. It’s best for anyone who wants a one-size-fits-all payroll option, where nearly everything a small business needs are included — from electronic new hire documents to health insurance to employee self-service, in addition to quick payroll processing. Gusto’s pricing is very straightforward. It’s $39 per month, plus $6 per month per employee. For 10 employees, as an example, it would cost $1,188 per year for all the requisite payroll features. That’s less than $120 per employee, per year. No upcharges mean you can plan and stick to your payroll budget. In addition to all the payroll features listed above, Gusto Core has HR and benefits options that make it feel like a full-service payroll company. For example, when someone is hired, you input his or her basic information and Gusto does the rest. The new hire receives a welcome email with links to payroll docs like W-4 and I-9 for e-signing. Gusto offers more than just payroll. One of the reasons we recommend Gusto is due to the extra features it offers. Gusto provides HR onboarding and gives your employees access to a mobile-optimized website that allows team members to view and update their own data online. It provides esignature and online document filing saving you from having to maintain paper employee personnel files. Gusto is designed with quick payroll runs of less than 10 minutes. You can set up your payroll to run automatically if all workers are salaried, and no time entry is needed. It provides direct deposit or pay card options, and can set you up with a pay-as-you-go workers’ compensation program, similar to APIntego. Gusto serves as a benefits broker in the United States. Benefits offerings include plans for health insurance at group rates most employees can afford. It also lets you set up retirement savings plans managed online like a 401(k) — all through the same portal. It’s a one-stop shop for your employees. Gusto extends customer support by phone and email. Since it’s located on the West Coast of the U.S., its hours are 8 a.m. to 8 p.m. Pacific time. You’ll receive HR support with the Core package, but if you want a dedicated support team, you have to upgrade to the Concierge service. There’s not much missing from Gusto, except that it isn’t currently able to offer group health benefits in all 50 states. At last count, it offers benefits in 24 states, but it continues to add more. Gusto also doesn’t offer a PEO option like ADP, and it doesn’t have features like an applicant tracking system. If you want those at some point, you may outgrow Gusto. Small business users love Gusto due to its ease of set up and use, and the fact that it saves so much time by providing employees access to their own information. The only complaints are that it lacks features employers may need as they grow past 100 employees, such as compliance reporting, and it doesn’t print and mail checks for you as ADP does. For information on package options and feedback from real users, check out our complete Gusto review. Gusto provides a free 30-day trial so that you can get a good look at all it offers before you sign up. Data you input is saved if you choose to sign up, and it’ll step you through the process with an easy online guide and chat support. With Gusto, you can be up and running your first payroll in just a few hours. Try Gusto free for 30-days. We recommend Justworks as a PEO payroll service that’s best for small businesses that want to offer employee benefits and services that match their larger competitors — everything from new hire onboarding to benefits offerings. We find Justworks offers the best payroll service value among the PEOs we’ve compared. You can sign up for Justworks with just two employees. 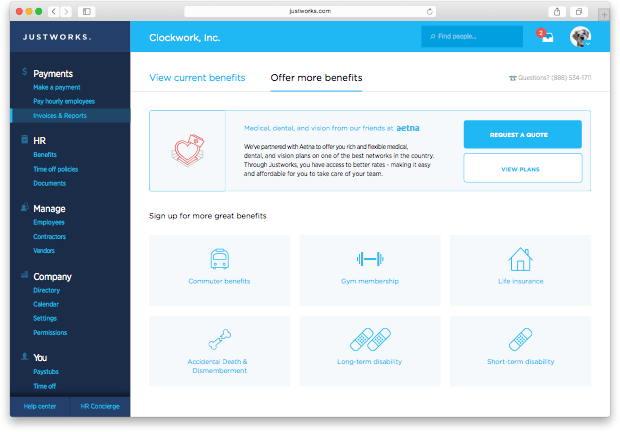 Justworks pricing ranges from $49 without benefits to $69 per month per employee with benefits for 10 employees. Therefore, Justworks is at the lower-cost end of PEOs with rates that are well below TriNet. In addition, the per-employee rate drops as you scale up and add more staff. Even at only $69 per month, per employee, you get full-service payroll, with HR and benefits included. Since a PEO is a co-employer, it’s more than a payroll service or payroll software. The employees actually work for you and for the PEO. For example, you manage their schedules, their work instructions, and interact with them like any other employee. However, they’re employed by the PEO, getting their paychecks, tax documents, and benefits from the PEO. You pay a per-employee fee for its services. By using a PEO, like Justworks, you get HR and benefits as well. As a full-service payroll provider, Justworks is easy to set up and use. It provides a self-service employee portal like Gusto but reduces the administrative work you have to do as a business owner. The advantage of using a PEO as your payroll company is that you’ll be able to offer employee benefits at group rates and also often receive lower-priced workers’ compensation insurance as well. Like Gusto, Justworks offers an employee self-service dashboard that allows them to see their own information. That saves you time as you no longer have to print copies of their forms or pay stubs. Justworks also manages your business compliance, which is helpful as each state and many localities have their own labor laws. In fact, Justworks, like Gusto can provide you with HR consulting services to help manage employment issues. Justworks includes time tracking in addition to automated deposits, one-off payments, payroll tax filings, and auto notifications. Like Gusto, it can process contract-employee (1099-MISC) payments as well so you don’t have to manage those in a different system. The benefits of a PEO, like Justworks, is that they leverage their buying power when it comes to benefits — for example, a health insurance plan, workers compensation or a 401(k) savings plan. Justworks can pool employees into a larger buying group and get group rates that a small business would be unlikely to obtain on their own. That allows your small business to provide big company benefits. Justworks offers support via phone or live online chat Monday to Friday from 8 a.m. to 8 p.m. Eastern time. In addition, Justwork’s Help Center provides solid information in an easy-to-digest format on topics for employers and employees alike, such as benefits, payroll, and taxes. 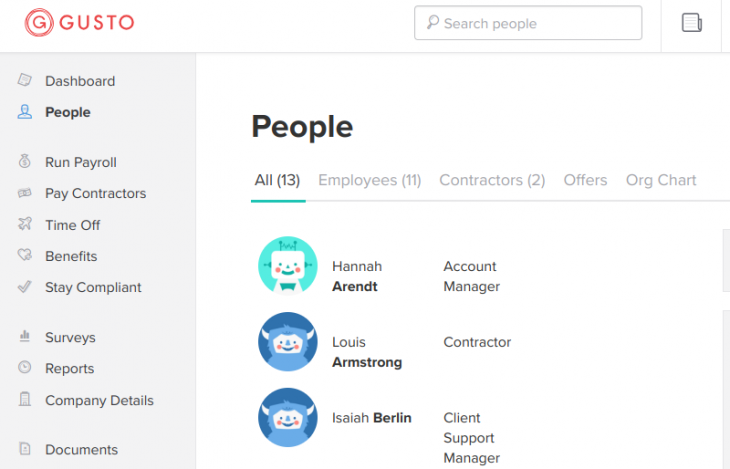 Justworks doesn’t yet have an applicant tracking function, and it’s geared for companies up to 99 employees, so if you’re close to that 100-employee mark and plan on growing, then Justworks might not be the best choice. You may want to choose a larger PEO option like ADP Total Source or a software service like Paycor instead. Justworks doesn’t have as many online reviews as Gusto but the reviews it does get are stellar. Small business employers and employees like the features and how easy it is to use. Some have mentioned a need for better reporting. For more insight, check out our complete Justworks review. Signing up for a PEO takes more time than other payroll services due to the application process. However, Justworks is streamlined compared to most. We recommend you go to its website and request a demo. It’ll gather your company information and contact you to walk through its services. Sign up for a demo. We recommend ADP Run Complete Payroll & HR Service as best payroll service for those already familiar with its interface and/or want to upgrade from other ADP payroll software. ADP caters to different sized business — from 1 to 49 employees, 50 to 1,000, and up. In addition, it offers multiple service options and price points. We compared its Complete Payroll + HR Service as it has the best feature set matching our requirements. There are two pricing tiers for the ADP Run Complete Payroll and HR package — $107.05 per payroll process and $126.35 per process, respectively. The only difference between the two prices is the number of job postings per month on ZipRecruiter — one posting vs two — and the number of background checks you get — five vs 25. ADP also offers a PEO option called ADP Total Source that costs significantly more; it’s shown below for comparison. *Your actual price is based on your business’ credit rating, risk profile and health benefits history. Even at the lowest price for ten employees, ADPs PEO option would cost $12,000 a year, which is significantly more than Justworks. However, it could cost as much as $22,000 which is even higher than TriNet. Some wonder why a small business would consider a PEO like ADP Total Source instead of free payroll software — the biggest reason is a PEO mitigates your risk of labor laws violations and fines, and in the long run, can save you thousands. The ADP Complete Payroll + HR is ADP’s top-tier payroll service for small businesses with one to 49 employees. It includes all of the payroll features expected, like payroll delivery as well as tax filing, year-end forms, poster compliance, and basic HR onboarding. This makes it more inclusive than QuickBooks Intuit, where you have to pay extra for things like posters. ADP Complete Payroll and HR is its top-tier payroll service that’s not a PEO. 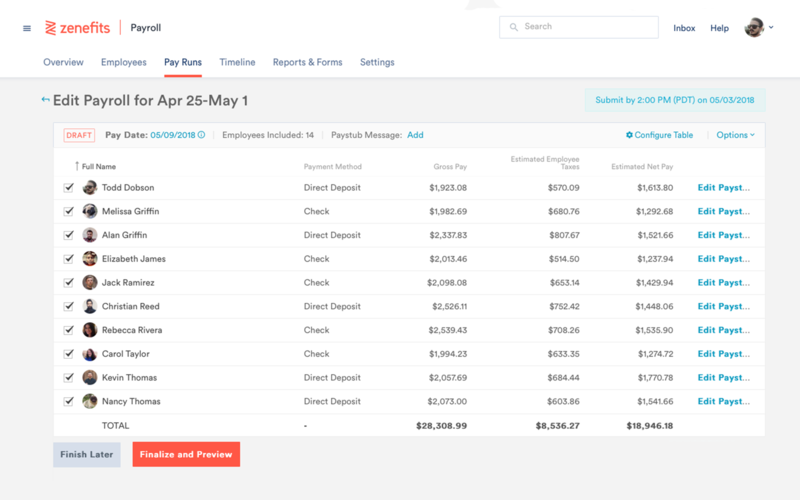 Here’s what you can expect with ADP Complete Payroll. Like Gusto and Justworks, ADP provides new hire reporting to the state. However, it adds cool features like federal compliance resources and a “tip of the week.” It gives you an Employee Handbook Wizard, and a ZipRecruiter account for posting jobs. It can even provide background checks. The ADP Run Complete Payroll + HR package also provides HR consulting services with HR certified representatives so you can call and ask basic HR, benefits and payroll questions. ADP provides the flexibility to run payroll from your computer, a mobile app, or a phone call. Payroll is the core of ADPs software. Employees can access basic information like pay stubs. If you want check signing and stuffing in addition to direct deposit or a payment card, ADP can handle that as well. You can manage your employee benefits through ADP as you can with most payroll software. However, ADP isn’t an insurance provider like Gusto. Instead, it works with most third-party health care providers to offer individual and group health insurance to its payroll clients. ADP doesn’t have the best customer support reputation, but it is available 24/7. However, be aware that it sends its overflow support calls to India. In addition, if an employee loses his or her password, ADP will refer that person to you, the employer. It will not assist your employees with basic issues like password resets. The biggest thing missing from ADP is a per employee pricing plan. ADP charges flat rates dictated by payroll processes, so small companies that run weekly payroll will pay more for ADP than payroll services like Gusto that base their pricing on the number of employees each month. If you’re in a state that allows payroll to be run monthly, that may be affordable; but if you pay your employees weekly, your price with ADP will nearly quadruple as compared to other services we reviewed. You’ll also pay extra for each payroll process such as a missed check, retro pay, or a bonus payroll run. That adds up. Small business users like the customization features of ADP, but don’t appreciate the upcharges. Overall, it has solid ratings in the 4 to 5 out of 5-star range. Check out our complete ADP review for additional insights. ADP, as a larger more established payroll company, has many payroll tools from which to choose. Therefore, you can’t just click a button to get started. Instead, you have to give it your email address to get a quote. It’ll set up a demo or sales call and match your business needs to the product that most closely fits what you’re looking for in payroll service. Get your free demo. We recommend TriNet as best for companies with employees in multiple states that want hands-off payroll services. It’s great for those who want to offer employees an excellent onboarding experience, group rates on benefits, and self-service all in one place. TriNet is the PEO that we use at Fit Small Business because of the features — like its insurance buying power that provides great rates for our staff. Like Justworks and ADP, TriNet can leverage hundreds of thousands of employees across multiple companies to negotiate better insurance plan rates. TriNet offers a good range of plans in all states in the United States, even providing medical, dental and vision insurance in small communities. One of the main benefits of TriNet, and why Fit Small Business uses it, is because it offers big-name health insurance plans to our remote employees and discounts to our distributed team. TriNet’s pricing varies based on location and size. A New York-based rate might range from $125 to $155 per employee per month. Based on our comparison company of 10 employees, TriNet’s prices ended up being $16,800 a year — more than double that of Justworks, which would come to under $6,000 per year for the same 10 employees. As TriNet’s pricing varies based on location and number of employees, you’ll want to contact it for a customized quote. In addition to all the standard features you’d expect of a payroll service, TriNet offers a wide variety of PEO employer extras. Most notable is the all-in-one easy-to-navigate user interface for both employer and employees. Employees, for instance, can manage everything from downloading year-end W-2s to looking up information about their benefits programs and providers themselves. TriNet offers many PEO extras, all available on a dashboard. TriNet stores employee data, signed forms, and provides employees with a self-service dashboard. Some standout features include your company organizational chart and people directory. If you set up and manage employee training, such as food safety, you can track that in TriNet as well. Unlike some of the other payroll services, TriNet has a mobile application in addition to its portal. It can manage unemployment, time off and expense reimbursement through the mobile app, saving you and your employees time and frustration. TriNet offers a huge range of employees benefits and also manages COBRA processing for termed employees. It goes so far as to offer you business practice liability insurance, keeping all your employee and insurance information in one system. In fact, it operates like your in-house HR and benefits department, in addition to managing payroll. TriNet provides customer service via phone and email. It also offers online case management that allows you to open a ticket on its website. It even has a separate email for employee questions. What it lacks is online chat and its hours are limited: Monday to Friday, 4:30 a.m. to 9 p.m. Pacific time. TriNet’s support hours are limited to weekdays. That may be a problem for small businesses like retail and food service that operate on weekends. In addition, it’s more than double the cost of Justworks. TriNet users rate it slightly higher than ADP, more on par with Justworks — nearly 5 out of 5 stars. Users liked that they don’t have to have an on-site HR person because everything they need is on the dashboard. Some employees reported minor difficulties, such as setting up their payment account. For more info, read our complete TriNet review. Even though Gusto, ADP and Justworks will be COBRA compliant if you have 20 employees or more, TriNet has COBRA compliance included in the base price. TriNet has been in business for 25 years and has more than 14,000 business clients. It’s got decades of experience in HR, benefits, payroll, and related functions such as risk management. Schedule a chat with TriNet. We recommend Intuit Full Service Payroll as the best payroll service for small businesses who want general ledger (GL) integration because it interfaces seamlessly with QuickBooks accounting software for those businesses already familiar with QuickBooks. However, you don’t need to have QuickBooks to use the Intuit Full Service Payroll product. If you already have QuickBooks, you might want to upgrade to the QuickBooks Full Service Payroll product instead. Intuit Full Service Payroll has several pricing tiers with nondiscounted prices that range from $30 a month for Basic up to $109 a month for Full Service with $4 per month, per employee, added on. It’s the lowest cost full-service online payroll solution that we reviewed, especially when you consider their discounts. We compared the Full Service payroll solution for 10 employees below to Basic, Enhanced and Full Service Payroll with QuickBooks so that you could see how the various options price out. *This option includes both full-service payroll and QuickBooks online accounting software combined into a bundle. It may be the best-priced option for those already using or wanting to use QuickBooks. Note that the first three options shown in the table don’t require you to use QuickBooks. The last option includes QuickBooks in the price — so if you go that route, you’re getting two online software packages for the price of only $119 per month, plus $4 per month, per employee. What’s great about Intuit Full Service Payroll — all your year-end tax documents are included. 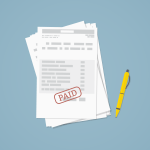 It sets up payroll, runs payroll, and files your payroll taxes for you. One thing you may have noticed about Intuit Payroll’s lower pricing tiers is that you would have to do your own payroll taxes, and there are add-ons for basic features like corrections to W-2s. 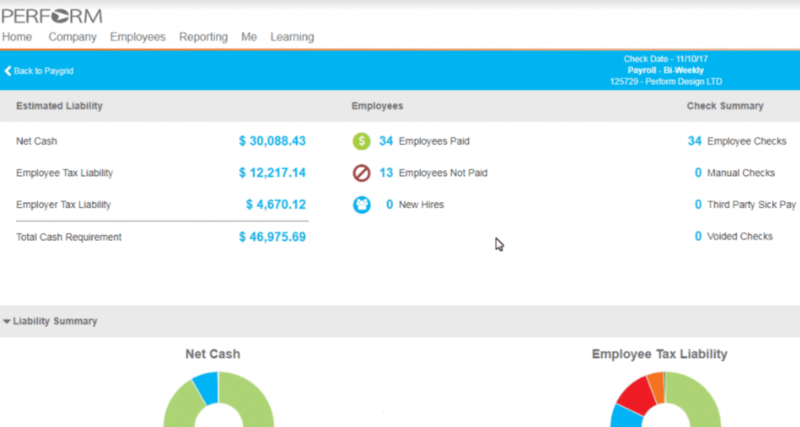 Intuit Payroll lets you manage accounting and payroll in one system. Like ADP, Intuit has multiple payroll service offerings. For more information on the different packages available, read our guide comparing Intuit’s Basic, Enhanced, and Full Service Payroll. In addition to basic payroll features, including direct deposit, will full-service payroll you get several benefits. Intuit payroll provides basic HR features like a list of employees and their data, but that’s about it. It doesn’t include HR add-ons like an org chart, employee performance reviews, training, or recruiting modules like some of the other payroll service companies offer. Intuit payroll personal assistance to set up your payroll so that it’s done correctly. It provides year-end tax forms and a guarantee that you won’t get stuck paying tax penalties. 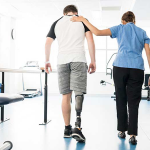 Additional features like pay-as-you-go workers’ compensation can be added for the cost of the insurance premiums plus a $5 per month processing fee. Time tracking costs $3 per person, per month. Features like automatic delivery of labor law posters also cost extra — the poster subscription cost is based on what states you are in and how many locations you have with on-site employees. Intuit payroll doesn’t provide benefits as ADP or Gusto do. However, if you obtain employee benefits through a third party, it can manage deductions for you. Intuit’s customer support is U.S.-based, and when you purchase Intuit’s Full Service Payroll, it’s included at no extra charge. It’s available by phone and email Monday through Friday 9 a.m. to 9 p.m. Eastern time and 9 a.m. to 6 p.m. Eastern time on Saturday. There’s also a payroll support center that provides helpful online tutorials and user guides. When you buy full-service payroll from Intuit, you’re getting the premiere version. Even so, there are upcharges if you want the time tracking add-on or pay-as-you-go workers’ compensation insurance. In addition, there’s no mobile application that allows employees to manage their own data. In addition, while Intuit can manage your benefits and 401(k) deductions and payments, it’s not a health insurance broker. You’d have to manage the data enrollment and deductions manually. It also doesn’t offer online onboarding or HR service capabilities other payroll companies provide. Intuit payroll earns reviews slightly lower than the other payroll companies we’ve reviewed. Users like the QuickBooks accounting software integration, but some find issues in calculations and tax payments. 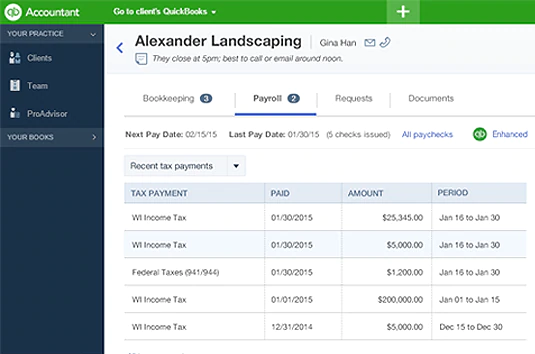 Read our Intuit QuickBooks Payroll review to see what users say about it. If you’re already using QuickBooks Online, you can sign up from the website by adding payroll to your existing online account. Otherwise, it’s best to go to its website and choose the 30-day free trial or buy-now option. Get your free trial. We recommend Paycor Perform as best for businesses planning on adding HR tools and modules as the business grows. It’s set up like an affordable full-scale human resources information system (HRIS) or human resources management system (HRMS) — much like PeopleSoft or SAP, albeit at a much lower price tag. The starting price and services are great, even for the smallest of businesses. Paycor can support a company of 10,000 employees; you can start small and not have to switch payroll companies as you grow larger. Paycor’s pricing is straightforward like Gusto, but costs even less if you have 10 or fewer employees. It’s only $49 per month. Adding employees costs only $3 per employee per pay period, similar to Gusto which charges an additional $6 per employee, per month. If you run every bimonthly payroll, Paycor’s per employee price is the same as Gusto. Unlike Gusto, which doesn’t have applicant tracking systems or online performance reviews a company will need as it grows, Paycor has it all. One of the primary benefits of Paycor as a payroll service provider is that its software uses widgets. You can customize it to your needs and turn features on as you need them. That prevents your interface from being cluttered with payroll, benefits, or HR tools you’re not ready to use. Paycor offers full payroll services and much more. In addition to the standard payroll features, Paycor provides several options and features. Paycor has easy-to-use modules that function together seamlessly, such as electronic document storage and human capital management tools like applicant tracking, learning management and workforce insights that employers may need as their business grows. Further, it can be customized to your business based on your industry or brand. Paycor, like ADP, was built around the payroll process and provides all required payroll options from multiple pay cycles to direct deposit. However, it functions more like a full HRIS with visually stimulating online reports and graphics. Paycor, like Gusto and ADP, provides Image result for Affordable Care Act (ACA)-compliant benefits and manages benefits administration like your annual enrollment. It can also manage your employee 401(k) plan through the same interface, meaning employees can manage their own plan changes. Paycor receives excellent feedback on its customer support. It can be reached by phone or online. It also provides an HR Center of Excellence with resources on topics like recruiting, labor costs and employee experience. It’s open 8 a.m. to 5 p.m. Eastern time Monday through Friday. There’s no support on the weekend. Paycor doesn’t yet have a mobile app. In addition, it doesn’t provide dedicated account reps, so you will likely get someone new each time you call. If you have questions on the weekend, you may be out of luck. Both small and midsize business owners like the all-in-one functionality and its industry experience. However, unlike services that provide you with a dedicated account rep, the quality of customer service often depends on the individual who answers your call. For additional information read our review guide on Paycor pricing and alternatives. If you’re looking for a payroll software program that costs little to start with and can grow with your business to an employee base of hundreds or thousands, it’s worth giving Paycor a try. That’s true especially if you want all the HR functionality like recruiting, performance reviews and training available to your business as you grow. Get a free quote. Zenefits is a payroll service that focuses on providing a full range of employee benefits to your staff. Unlike a PEO, it’s not a co-employer. Instead, it’s a service that provides a full suite of solutions in addition to payroll, such as HR tools like org charts, and benefits like health insurance and a mobile app. Zenefits starts at $40 per month with monthly per person fees that range from $6 to $12 per month. However, those prices go up as you add features, you’ll need in a payroll service like payroll processing. 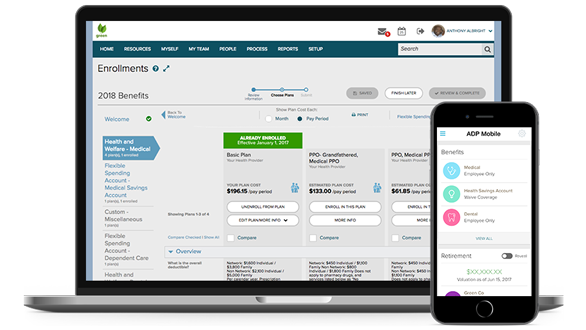 Its standard package includes an HR platform with employee data, an org chart, and onboarding while the advanced package adds on-time tracking and ACA compliance. Apart from the Standard and Advanced plans, below are add-on features that users can opt to include in their subscription. Each of these services is billed based on the number of employees you have. Therefore, to get payroll processing with the standard package, you’d pay $40 per month plus $12 per month, per employee, similar with what you’d pay if you went with Gusto’s higher tier. In addition, you’d still have to pay for add-ons like a payroll advisor, which Gusto includes at no extra charge. Unlike ADP and Paychex that began with payroll as its core platform, Zenefits is built around employee self-service and employee benefits. That makes its interface easier to use from the employee point-of-view. It also has a performance management add-on like Justworks can provide, but it costs more. Zenefits payroll processing is integrated with its HR and benefits platform. Zenefits provides an excellent array of HR features including processes to onboard new hires and manage their data. It also has an employee directory and org chart as well as HR reporting that lets you visualize your HR data. In addition, it provides a compliance assistant to ensure you’re on track with federal and state labor laws. That’s useful once you begin hiring employees in more than one location. 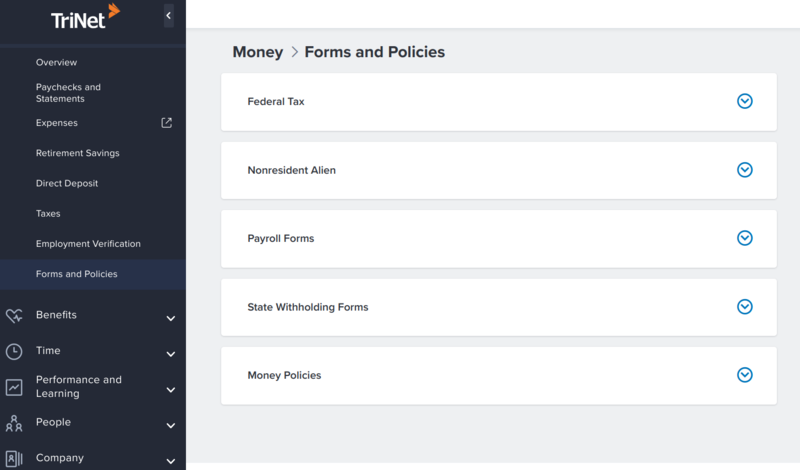 Zenefits offers payroll in the U.S. only. It provides a mobile app for you and your employees to manage online data like pay stubs and year-end tax forms, which it files on your behalf. Timekeeping is available as an add-on, or you can interface with free time and attendance software like Homebase. In other words, it does everything payroll software should do. Benefits are what Zenefits is all about. It provides everything from employee health care to commuter benefits without you having to worry about interfacing your software with multiple benefits providers. It’s all in one place, available to your employees through its mobile app. Zenefits provides multiple levels of support for you and your employees. It offers an HR advisor or payroll advisor service that can help you manage everything from retro pay to questions about at-will employment. However, unless you pay for one of its advisory services, your only help options are online. You send an email or fill out a form, and it’ll get back to you. Zenefits is on the pricier side when you start to add in the features it offers, such as performance management, time and attendance, and its paid advisor services, which some of the other providers like Gusto include or provide at a lower cost. Zenefits has solid reviews in the range of about 4 out of 5 stars. Many find it helpful to have their benefits offerings built into the same software that manages their payroll and HR data. Others comment on how innovative it is, frequently offering new features. However, some have mentioned their customer support is weak and payroll and accounting options and reports aren’t as flexible as other providers. To sign up for Zenefits, you have to go to its web page and call its sales team or click on the Get Started option. You can then choose to schedule a personalized one-on-one, attend a live demo or try a fully interactive demo. Get started with Zenefits. When it comes to the best payroll service for your business, you have multiple options. Making the right decision for your business depends on your immediate needs and your plans for growth. For additional resources to help you make the best choice for your business, we have payroll software reviews, a guide on how to do payroll as well as payroll articles comparing many of these providers side by side. If you’re looking for a proven payroll provider that offers a full-service payroll option, consider ADP. It provides multiple payroll services from online payroll software to a PEO option and can help you choose exactly the right level and software and services you need to manage your employees. Start your free trial.